Conversion Rate Optimisation will increase the number of your website’s visitors into customers. The process involves making tweaks to your website so that a higher percentage of people take action when they visit. Whether that be completing a Lead Gen form, downloading an app or purchasing a product. We assess how visitors interact with your website, from this we then generate ideas that could help increase it’s usability in order to encourage more engagement. Doing so using various tests and refinements. The main benefit of a high conversion rate is a much-improved Return on Investment. Our Conversion Rate Optimise Service is unique to every client as it’s suited to your businesses unique requirements and objectives. We start by auditing your current website and producing a report with recommended tests that are likely to have a dramatic impact on your bottom line. 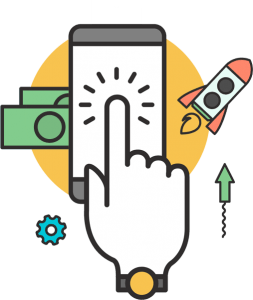 If your website is receiving lots of traffic but has a poor conversion rate then our CRO service could be the ideal solution to unlocking your website’s true potential. By improving the user experience on your website we can increase the likeliness that a visitor makes out a purchase, this is done by understanding how users use your website and eliminating any issues or walls discouraging visitors from converting. It’s very easy to implement things just because you think it’s the right thing to do but we prefer to take a scientific approach to optmising your landing pages. We focus on the overall Funnel, Outstanding User Experience and Higher Returns. We use the latest technology to see exactly how your customers flow through your website and how to optimise their path. We make sure your users have a lovely time when using your websites and there’s little to no friction to go about their browsing. We look at the big picture when planning the impact of optimising your landing pages. We don’t get carried away with the technical side of things and realise that making you more money is vital. Why use our Landing Pages? We don’t use templates. Everything is built from scratch with your brand and business in mind. We find out how your users navigate your website, what issues they have as well as any friction holding them back from purchasing.